The company has developed innovative technology that evaluates whether the IT services used by businesses are enabling or hindering their staff and customers, and is based on ten years of Networks Group research from the School of Electronic Engineering and Computer Science. Internet and corporate applications are delivered over complex digital supply chains and underperformance here can have a huge economic impact. Actual Experience’s unique technology benchmarks how good the digital experience should be, quantifies how good it actually is, and continuously assesses the health of the digital supply chain to identify the reasons for the gap between the two. This enables businesses to locate the underperformance that people notice, helping them focus their support resources where they will have the greatest impact. Since last year, when the company won the 2012 IET Innovation Award for Information Technology, the customer base has more than tripled, including blue chips in Germany and the US. To support continued expansion, both in the UK and internationally, the company has recently completed a £4m financing round with one of Europe’s largest investment managers – Henderson Global Investors. 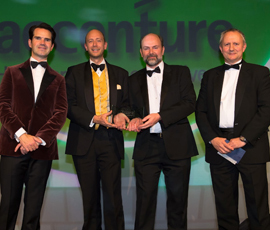 The company recently scooped another prestigious industry award for technology excellence when it won the UK Innovation and Entrepreneurship category in the 2013 UK IT Industry awards run by BCS, The Chartered Institute for IT. In the past few weeks, Actual Experience has been contracted by Ofcom (the UK communications regulator) to investigate the state of ‘Digital Britain’ and help to improve people’s experience of using the Internet. They are recruiting volunteers to run their free analytics software. Users will see the same analytics as Ofcom, live in their home – enabling them to see how well their broadband can support the nation’s most popular applications. They will also be able to compare their experience against a national standard for broadband excellence. This data, from hundreds of users, helps Actual Experience, Ofcom and broadband providers deliver better service for people all across the UK.